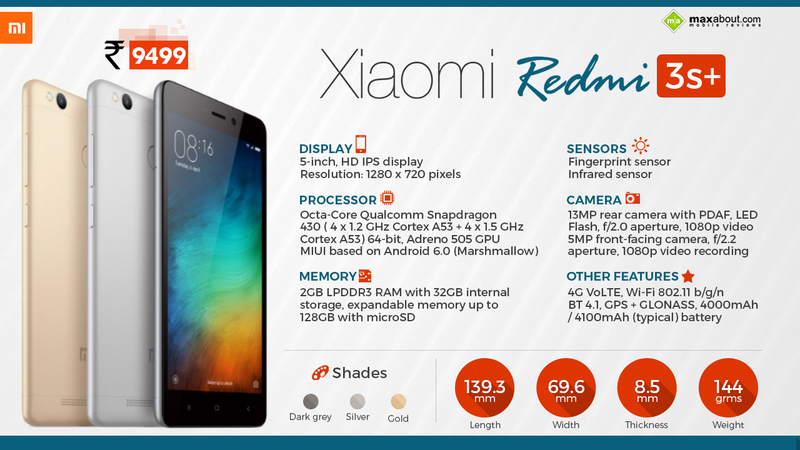 Xiaomi's first ever phone to be sold through physical retailers, the Redmi 3S+ has been launched in the country with the tag of 'offline exclusive phone' for INR 9499. The brand will be selling the phone through 7500 retailers in India and marks a new direction in the history of the brand. It entered India through exclusive partnership with Flipkart while after some time, it went on sale through Amazon and Snapdeal also. The company partnered with 'The Mobile Store' and even 'Bharti Airtel' last year while has also partnered with Redington for large scale distribution. The phones which are available through physical stores are Redmi 2, Mi4, Note 3, Mi5 and Mi Max. These are also sold through online partners while the newly launched Xiaomi Redmi 3S+ would be exclusive to these physical stores only. They expect to generate 20-30 percent sales through offline platforms in the coming years. The phone comes with excellent statistics, which include 5 inch HD display, 1.4 GHz Octa Core Snapdragon 430 processor with 2 GB RAM and 32 GB of internal storage, 5 MP front as well as 13 MP rear camera and a huge 4100 mAh battery. The phone even carries a fingerprint sensor on its back and comes with 4G VoLTE support. The phone measures 139.3 mm x 69.6 mm x 8.5 mm and weighs 144 grams. The dual SIM smartphone has a hybrid SIM slot for an expandable memory capacity of up to 128 GB. The sale has already started from 1st October 2016.